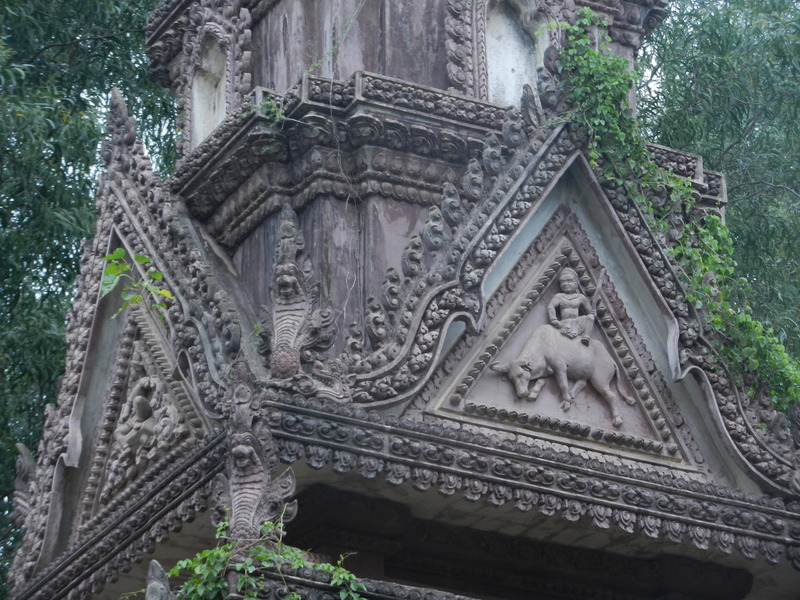 Cambodia has so many ancient Khmer temples and so much natural beauty that they’ll always give you new things to see. But it also has other great sights to explore. 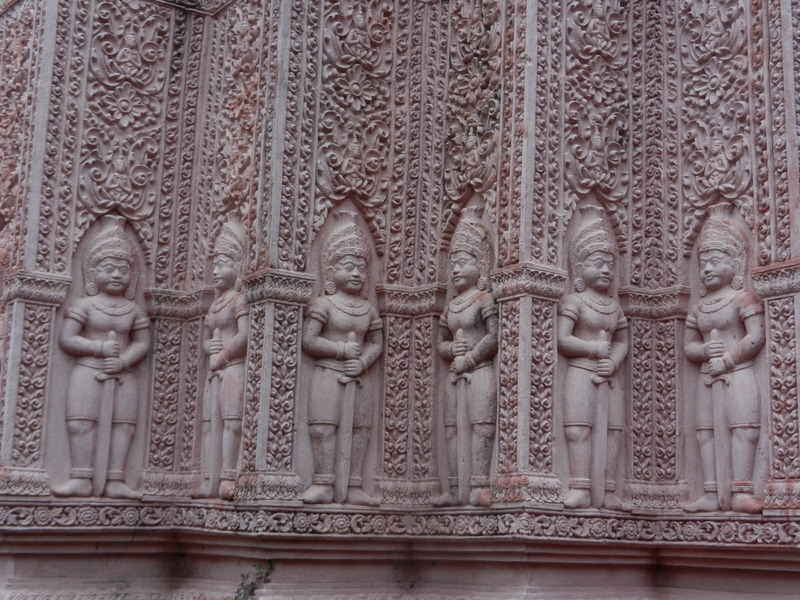 On this trip I visited as many modern temples as I could, and I found that Cambodians are doing creative things with old Khmer art forms. Wats have many elegant buildings besides the main assembly hall. People with money erect a large stupa that houses their ashes when they depart. 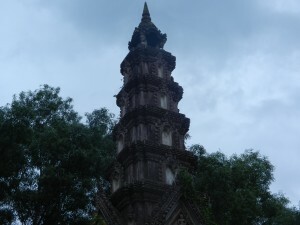 Temples have sections where many sprout up. You can spend a long time savoring their elegant forms because each is unique. You can see the peaks of the bodies at the bottom of this picture. 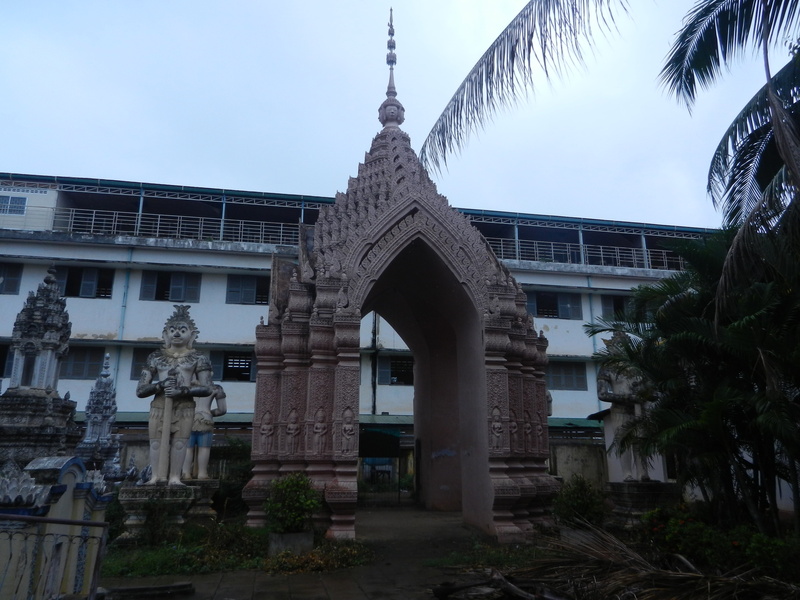 The shrine has several levels stacked on each other, but it’s much thinner than ancient Khmer monuments. 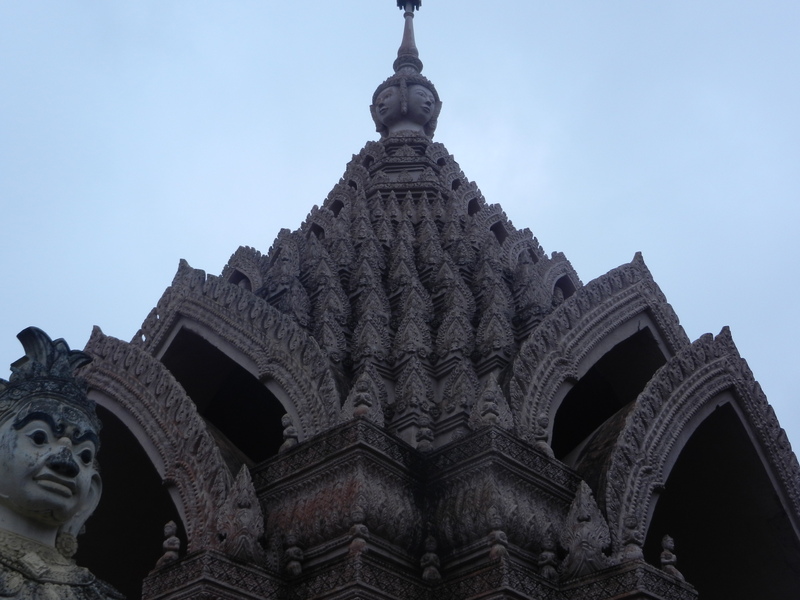 Thai stupas undulate more as they rise to the heavens. Khmers liked sturdiness more, so their monuments were usually more squarish. The builder of this stupa used this sign of order and well-being which Khmer kings implemented to govern their empire, but modified the forms into something more spiritual–its thinness stresses the vertical dimension. The shrine is thus less imposing. Like ancient Khmer temples, modern Cambodian wats have elegant gate-towers. –the roof on this gatehouse is more elaborate. 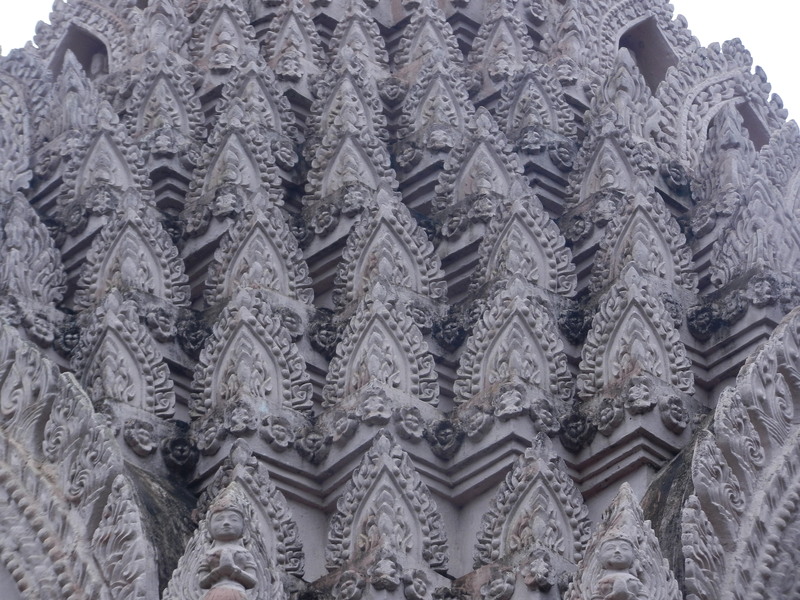 It multiplies the rounded triangular forms that frame many old Khmer carvings. 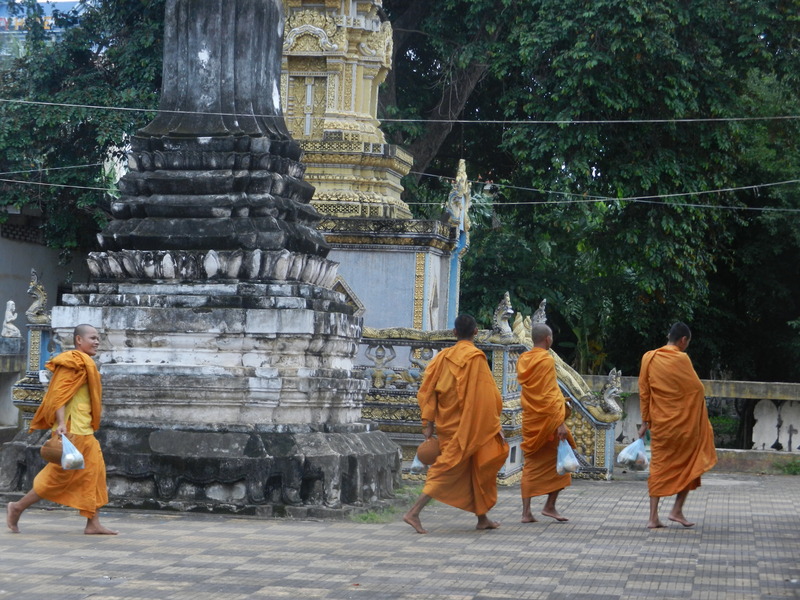 They’re dense, like the Cambodian jungles, but also spiritual. They rise upwards as though the builder saw the path to the heavens in terms of the natural environment. they play off of each other. Each one is unique, and all are exuberant. 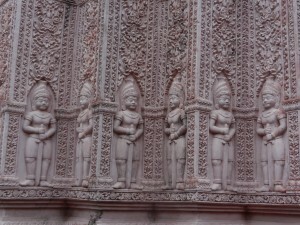 They all have the old Khmer spirit. Like Angkor Wat, their elaborate forms exult in life’s abundance. In this way, they reflect Cambodia’s natural landscape. The old Khmer glory lives in people’s aspirations for the highest spiritual goals. 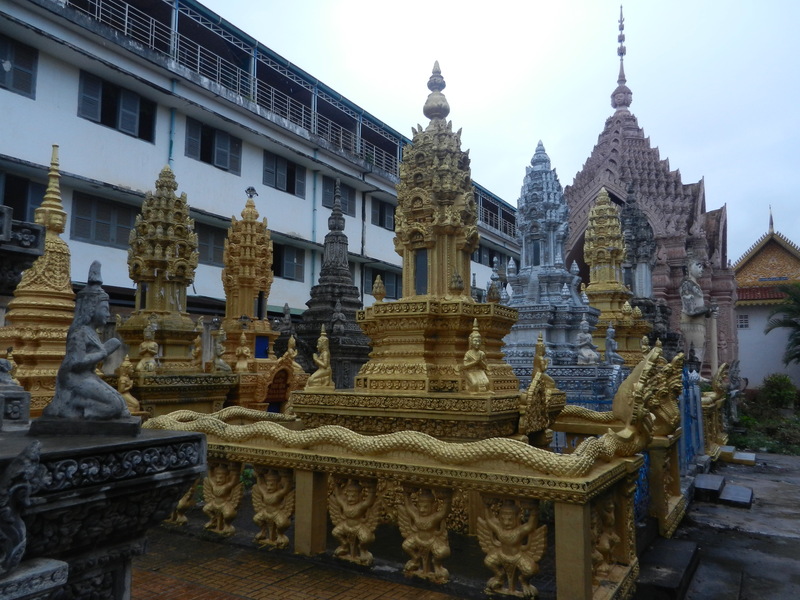 You can walk around Cambodia’s wats and enjoy endless varieties of Khmer-style heaven.